Ontos: "A Diffusion of Darkness"
TEN THOUSAND BLUNT INSTRUMENTS AND OTHER TALES OF MYSTERY. 2010. 258 pages: 6 long stories. A writer's writer, a renaissance man of letters, a hugely prolific author of limitless versatility and imagination, one of the most popular and influential writers of his time, a profoundly original thinker, an unflinching critic of American morals and mores; controversial, provocative, iconoclastic—these are just a few of the many laudatory descriptions of Philip Wylie by critics, scholars, and aficionados of his work. The list of his literary endeavors is as richly varied as his interests and his personal resume. 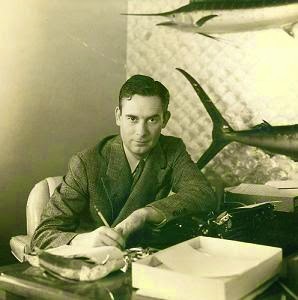 Astonishingly prolific (he once dictated a 100,000 word novel in nine days while on a ship crossing the Atlantic), he produced, by his own estimation, forty-eight million words of fiction and nonfiction over a period of more than forty years and saw a third of that number in print. When it comes to mysteries, says Pronzini, "Wylie's ingenuity and grasp of the elements of successful detective fiction are evident." Kudos to Crippen & Landru for saving these fine works from obscurity. At this particular moment, a hundred detectives, policemen, reporters, newsreel cameramen, and others are after me. I've evaded them as long as possible. And I want to have a statement prepared for the first of them that overtakes me. So here is my side of what just happened at Galleon Key. Douglas Lee is a man to be reckoned with, ruthless in his business dealings and never one to back down. When Lee's secretary, James Martin, falls in love with Lee's daughter, Diana, and tries to elope with her, Lee stops it cold. But Martin isn't one to back down, either, and several months later tries it again, this time at a Florida fishing resort. Unfortunately for Martin, Lee gets himself murdered under circumstances that defy the laws of physics. Fortunately for Martin, however, he isn't the only suspect; there's more than one camper present with a good motive to do Lee in—and to see Martin hang for it. The newspaper-reading public never learned the details of the Manhattan Commercial Bank and Trust Company robbery. The story was made a secret for a variety of reasons, not the least of which was the humiliating part played in it by the police. In missing the inside story of this robbery, the public also missed a glimpse of one of the strangest persons living in Manhattan. The brilliant sleuth and silent avenger of the bank disaster was himself a former bank clerk. His name was Willis Perkins. There are a great many people like Willis Perkins, but few of them, because of their very nature, attain to a parallel success. For twenty years Willis Perkins worked as a bank clerk; for longer than that he nursed an ambition to be a private detective. Now that he is retired, he tries to fulfill his dream—without, however, initial success. With the scornful laughter of one of his clerking friends still in his ears, Perkins is about to call it quits when a robbery of monumental proportions occurs. Three million four hundred thousand dollars ensconced in a bank's inner vault have disappeared—with the vault!—and the police are predictably frantic. Is it barely possible that as he tamps shag tobacco into his meerschaum pipe, fixes his gaze on his nearby fore-and-after tweed cap, and lapses into a half hour of concentrated ratiocination that Willis Perkins could divine not only how the crime was committed but also where the boodle went? Although, to be fair, he does acknowledge his indebtedness to a story by a genius named Poe. When the police are confronted with that ugly evidence which is proof positive of premeditated murder they do not first "cherchez la femme." They look immediately, rather, for any persons who might profit by the evil deed. Lust, envy, spite—all these yield place to greed in forming the mental flaw which sets one being cogitating on how to destroy another. And the horror which accompanies those patient, relentless, often imaginative steps toward homicide is sometimes accentuated by improper setting. For not all sinister human behavior is cloaked in darkness. Not all hellish footsteps echo through murky corridors, empty garrets, abandoned buildings, crypts, caverns, and the tree tunnels of lonely lanes. Sometimes the roaring city, the dazzling street, and white sunlight form the incongruous background for slinking assassins as terrible as any on a storm-swept castle roof or a fog-wrapped moor . . .
Young Jerry Jenks is a struggling Greenwich Village magazine illustrator who occasionally collaborates with Holly Barker, a fellow artist and sometime model. Jerry has fallen in love with Betty Stanton, the potential heir to twenty million dollars, and she feels the same. Her three snobbish brothers beg to differ, however, opposing with varying degrees of severity any betrothal between the two. In the middle of a New York heat wave, one of Betty's brothers collapses and dies in Grand Central Station, and Jerry is there. Natural causes, say the doctors. Jerry is there when another brother, while in the middle of a political speech, also collapses and dies. No obvious foul play, says the doctor. But when the third brother dies in a dentist's chair, the suspicions of the police, needless to say, are aroused and personified by a smart Irish cop; and although Jerry wasn't there, he's now a prime suspect. Think about it—three barriers standing between him and twenty million simoleons and a beautiful heiress have been conveniently removed, and the attractive legatee shouldn't constitute much of a remaining barrier to that huge pile of moolah. Being an artist, Jerry isn't accustomed to ratiocinative logical thought; so if he's going to get out of this jam, he'll need to play to his strengths and get the picture—fast! It was three-twenty a.m. Jim heaved his battered suitcases from beneath the day coach seats and walked past sleeping passengers to the vestibule. A solitary red light slid through the blackness, and the train stopped. "Paradise Canyon!" a distant voice shouted. Jim Preston is new in town. Although he's an engineer, he's also an Olympic swimmer, which is why he has been hired as a swim coach at an up-scale desert hotel in Paradise Canyon. But even before he can get settled in, he narrowly misses being shot in what could be dismissed as an accident. Not only that, but later that same day Jim comes across a riderless horse roaming through the desert with a broken and bloody saddle. It isn't long before two murders have been discovered and, despite being the new guy, Jim falls under police suspicion, mainly because one of the victims was stabbed with a knife that has Jim's fingerprints all over it. Despite all this hurly burly, however, Jim still somehow finds the time to fall in love with Frankie Bailey, the step-daughter of one of the hotel's affluent guests. But Frankie has a fiancé, a young man who, in Jim's initial estimation, just might be insane. And speaking of insanity, could that explain why, for several years in a row, a few of the wealthy guests have been seen riding out into the empty desert, lying down in the sand, and putting their ears to the ground, as if expecting the earth to whisper something to them? As Jim will discover, though, there's method in their madness. Chief Watson read the letter, polished his bald head with the heel of his hand and muttered, "Crank!" Lieutenant Quag, who was sitting nearby, failed to hear. "What'd you say, Chief?" The bald man held up a typewritten script—seventy pages of it—and yawned. "Some dope thinks he solved a murder, I guess. He's written the cops a love-letter about it. Imagine!" Then he began to read. For a few minutes his expression was one of sour amusement. Presently it ebbed line by line and was replaced by deep concentration. He leaned over his desk on his elbows and wet his thumb to turn the pages. Such a normal family, the people across the terrace, in every respect as unremarkable and "All-American" as one could wish. Yet now they eye each other with suspicion, communicate in reserved tones, and behave circumspectly in one another's presence. One of them has apparently died accidentally of mushroom poisoning, but the realization has gradually crept in that it might not have been an accident after all. Newspaperman Ralph Walker is temporarily blind after an operation and staying in a friend's apartment until he can recover. Without his sight, Ralph has concentrated on sharpening his hearing skills to compensate. It's only in retrospect that he comes to realize that among the many and diverse sounds that have drifted from the terrace through the sultry air and into his bedroom were the sinister preparations by someone planning to commit murder. But how can Ralph present such insubstantial proof of his suspicions to the police when even he is unsure that a crime has been committed, when he can just barely get out of his bed? The killer—yes, there has been a murder—has a different problem: This person can't afford to leave any loose ends and is counting on Ralph's nearly total helplessness to ensure that nothing will be left to chance . . . .
Because she had no patience with what she regarded as a weakness in herself, she went into the big room. A tolerance for weakness - for - timidity, especially - should be reserved for other people, Gail thought. There wasn't anything new about her phobia. She'd felt it when she was a kid—on her first trip to a museum. She'd felt it in college when her geology class went to Belvidere Hall to inspect the fossils. She felt it now. Outside, the early winter afternoon was dim with foreknowledge of night. There was light, ample in its way, in the gigantic chambers of the American Museum of Natural History. But the electricity threw shadows. And the windows let in a diffusion of darkness, a murk that emphasized the wrong things and made the reassuring ones indefinite. In the dead of winter, inside the dim corridors of New York's Museum of Natural History, in the service of the war effort researcher Gail Vincent is collaborating with Professor Horace Jordan on possible sites in Africa that would be suitable for constructing airfields, which could prove decisive in defeating Hitler's war machine. As if to confirm her deep-seated fears of the dark and cavernous museum, an unexpected and gruesome event occurs: The body of one of the museum's senior scientists is found in a large tank of preservative, his skull crushed by a blunt instrument of some kind. The inevitable questions arise: who, when, and why? Did he know too much? Too much about what? As for the murder weapon, it could be one of a myriad of objects housed almost anywhere in the museum's twenty-three acres—and that's assuming it hasn't already been carried away. Although the police are doing their best, Gail and Prof. Jordan see how the cops are out of their depth, so the two of them institute their own unofficial investigation, during which they turn up several good bits of evidence, but nothing that would decisively break the case open. As it turns out, by piecing together facts that seem oh so innocent in isolation, Gail arrives at the solution. 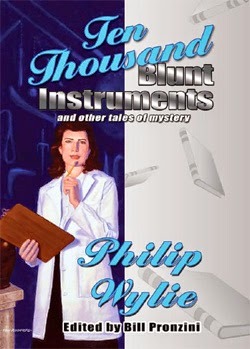 Unfortunately, someone with a gun knows she knows . . . .
- Bibliographies of Philip Wylie's huge output are HERE and HERE. - Articles about Wylie are HERE and HERE. "We're Going to Murder Him Again"
"Just one more thing . . . ."
"It's a Smile of Death"
"A Cloud of Blood Sprayed Over Them"